Symposium D, 'Energy Critical Materials' and Symposium G, 'Materials as Tools for Sustainability', were held on November 25–30 at the 2012 MRS Fall Meeting in Boston, Massachusetts. Many technologies that currently impart significant benefits to our society cannot continue indefinitely without depleting or despoiling key resources, and more sustainable paths must be sought. Sustainable development that raises global standards of living and promotes economic growth calls for materials science to develop advanced technologies and strategies to use our finite material and energy resources more efficiently. 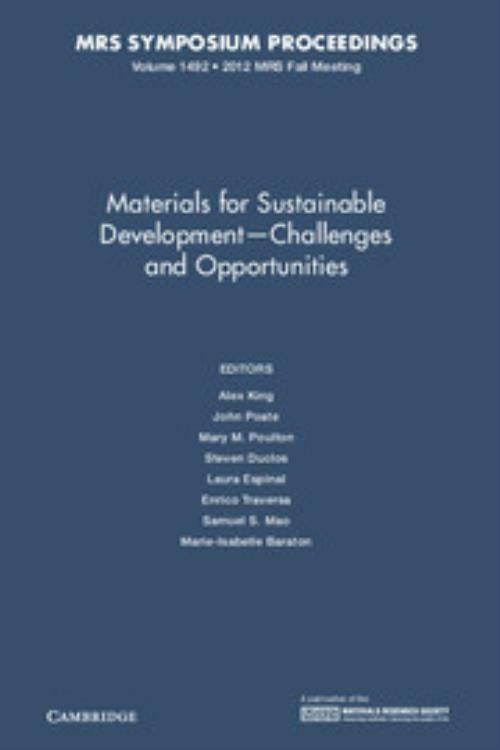 This volume presents a compilation of emerging research on sustainable development in the context of product manufacturing, catalysis, transportation, and energy-critical materials. Each paper provides a glimpse of exciting recent developments, including: critical elements for next-generation batteries, phase change materials for energy efficient buildings, weathering resistant materials, 3-D printing technologies, flame retardants with reduced toxicity, and stimulating life-cycle analysis examples in various applications. 25. Salt as alternative energy material to fossil fuel . John Poate Colorado School of Mines. Mary M. Poulton University of Arizona. Laura Espinal National Institute of Standards and Technology, Maryland. Enrico Traversa King Abdullah University of Science and Technology, Saudi Arabia.